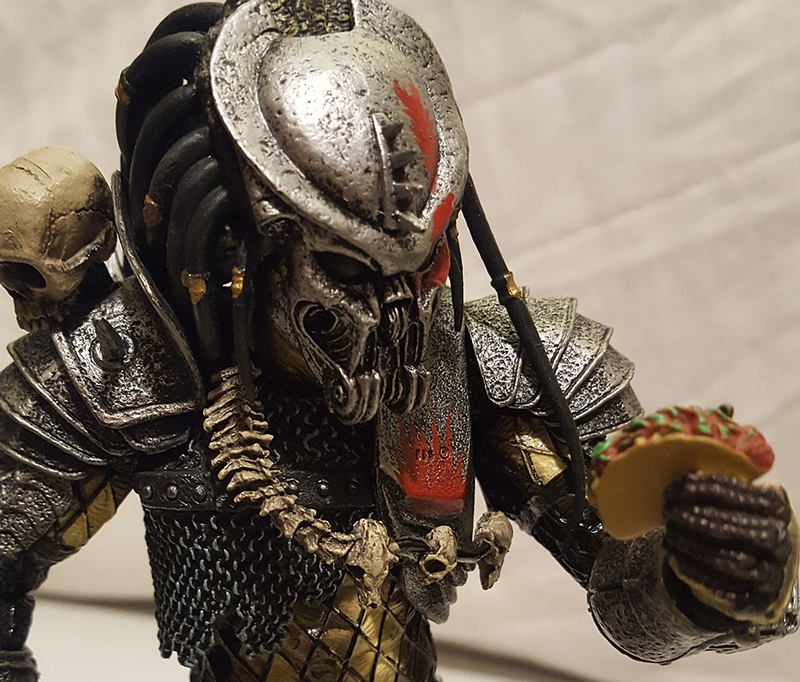 Posted by David Boyce in Advent Calendar 2016, NECA, Predator, Review with 0 comments. Ah yes, Concrete Jungle. When you talk to Predators fans, two different things pop up in their heads. It’s either the pioneering 1989 Dark Horse comic that stars Arnold Schwarzenegger’s older brother who is a New York City detective. A man who stumbles upon a Predator in the city and somehow makes a connection to the disappearance of Dutch. So he goes down to where the finale of the original movie happened to fight the Predator there instead of doing it in New York. Oh, and apparently there are Colombian drug dealers that had beef with Detective Schaefer who were also coincidentally at the same location and he gets to fight them too. Oh, and then he goes back to New York to fight off a full-scale invasion by wearing a Predator mask to get past their cloaking, with the help of gang members that wanted him dead. Oh, and then they decided to make two more sequels with Detective Schaeffer that are just as over the top fanfiction.net approved insanity as the first. Or, they would be thinking of the video game released in 2005. In this case it’s the latter but we technically got the other Concrete Jungle Predator when NECA did its 25th anniversary ‘first appearance‘ figure last year. This is Scarface, a Predator who went after 1930’s mobsters but goofed up, let his tech get into the hands of humans, exposed his race to Earth, and then got shot in the face for his troubles. Scarface failed to commit Predator seppuku so his elders sent him into exile. One hundred years later he gets a chance at redemption with really bad controls and cheap gameplay. However, I already went off on one side tangent, and don’t want to go on another. Seriously though, this one has future crime lords, robots, evil Predators, and of course Xenomorphs. It’s just as ridiculous as the comics, so let’s talk about the figure. Starting with Predator series 14, NECA made a new mold for their figures, and Scarface is the latest recipient of that upgrade. However, he deviates from the path we have seen in series 14 and 15 with those figures having slight variations of their upper armor and masks. If you didn’t give those figures a second glance you would think they are all the same thing. Scarface bucks that trend. He looks like he was conceived while his parents were listening to Iron Maiden in the back of their tricked out van that may or may not have had wizards airbrushed on it. The armor Scarface is sporting is vastly different looking from the sleek and smooth armor we are used to seeing on previous Predators. He’s adorned in weathered chainmail, spiked medieval-esque pauldrons/boots, and a couple of skulls for good measure. Scarface shows that he wears his victims, and doesn’t just display them on a dumb shelf that keeps pouring out dry ice like those weirdos from Predator 2. The mask is resculpt of the Celtic Predator’s mask from series 14 and more recently the ‘Rivalry Reborn’ 2 pack, but with the addition of some red paint and even more spikes. I can’t fault NECA for a reuse in this instance because the game developers actually used Celtic’s mask for Scarface’s model. Scarface is bundled with quite a few unique accessories. Being that he is a separate deluxe release much like any NECA ‘Ultimate’ figure he gets a little bit of special treatment. He comes with an extra right closed hand, two wrist blades, a speargun, an unmasked head with missing eye, a giant glaive, and of course a plasma caster. The wrist blades are removable which I hope is a permanent change going forward as the older Predator figures wrist blades kind of get in the way even when they are sheathed in their gauntlets. The weapons here are MASSIVE compared to the piddly combisticks of past. The speargun looks like a huge death dealing yet delicious looking croissant, and the glaive reminds me of something I would see on my uncle’s old Megadeth shirts. If you really want to, you can swap his accessories out with the AvP guys and vice versa. I have to admit, the long wrist blades that come with Scar look good if not better on Scarface. I can understand if you passed on Series 15, but the demand for Scarface among fans has been ridiculously high for a few years now. He is so radically different and unique looking from the recent Predators that we’ve seen. I would be hard pressed to tell you to pass on him. Also if you have the spare time seriously track down that old comic, it’s so bad it’s good. You can grab the new Ultimate Scarface Predator on Amazon! Final Verdict: Batshit comic, crazy game, awesome figure … NICE!